Admittedly, I have never bought a package of Yves, Tofurkey (or any other brand for that matter) deli style fake meat slices. After my trip to Portland, having seen them on many menus, and still never giving them a try, I thought to myself, "Why not?" Afterall, it's been in the triple digits here, and cooking just didn't seem like a chore I wanted to deal with. So, I bought a package of Yves "Salami" style slices, as well as a package of Yves "Roasted Turkey" style slices. 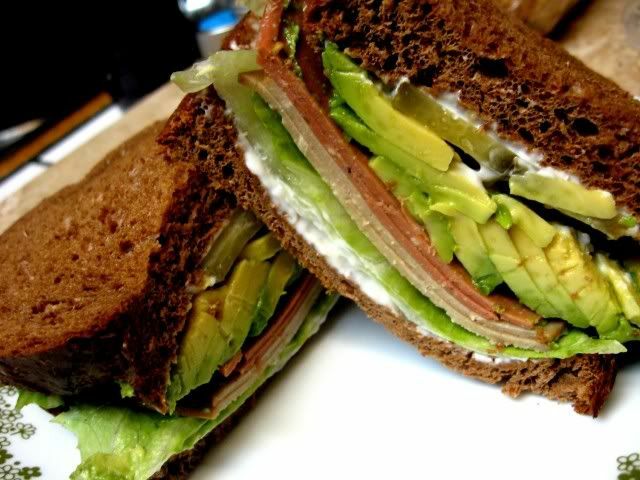 With a trusty jar of Vegenaise, a few leaves of cold, crispy iceberg lettuce, some Bubbies garlic pickles, an avocado, and some molasses sweetened wheat bread, I created a sammy that was quite delicious. I can't say that these fakies tasted like the real thing, and that's certainly okay with me, but the fact that there was something other than veggies on my sandwich made me a happy girl! Try the Tofurkey slices. They are a lot more flavorful than the Yves and an over-all better texture. Every now and then nothing tastes quite as good as a deli sandwich! Mock vegan and vegetarian meats in America are so far advanced than the range we get in the U.K which are limited to a few brands. Every once in a while I get a craving for a Tofurkey sandwich, and nothing else will do. I like the fake meats as a sometimes food, for sure. Yeah I'm with Mangocheeks, the UK ones are pretty crap. That sandwich looks rad though! I also agree about the Tofurkey! They are very thinly sliced - "deli style." Definitely tastier than any other fake lunch meat. And I never even liked cold cuts as an omnivore! I'm also not a cold cut girl, though that would make sandwiches easier. I tried the Yves a few years back and hated it — the texture reminded me of milkweed, blech. My hubby eats loads of sandwiches (filled with meat, sadly) and I am always looking for something to put in them alongside the veggies. Next time I will try the Tofurkey. I do wish everyone had a little tester package for $1 to see how we liked it before buying a stack of the stuff. Grr. um yes please! this looks so amazing good i wish i had some in my fridge. I HATE faux meats...but for some reason I'm ok with Tofurkey. I think it's because they don't try to replicate the taste of the "real" thing. Ewww. Holy cow Joni! Well... holy soy. That looks amazing! Thanks for this and the other great PDX posts.